Perval scale was constructed in the literature as a measure of consumers’ perceived value for the retail industry. The study aims to generate a scale for measuring the perceived value of white goods customers in Turkey over the Perval scale, which is studied for several sectors in the literature. To understand the customer preferences of durable-goods consumers, we use the Perval scale that is highly studied in the literature as a basis for many sectors except white goods. Another goal of this study is to generate a survey to measure the perceived value of white goods’ customers, eventually to be named as WhitePerval. The outline of this survey generation process begins with examining the literature of Perceived Value, Consumption Values and Perval scale and continues with the adoptation process of Perval over white goods customers. Qualitative research design is used to clarify our research construct. For that purpose, content analysis and a survey design on the construct, validity and reliability analysis are also studied for WhitePerval. The adopted WhitePerval scale can be extended to cover perceived value measurement for all types of home appliance products and may also be an input for other models in other countries. Akkucuk, U., & Turan, C. (2016). Mobile Use and Online Preferences of the Millenials: A Study in Yalova. Journal of Internet Banking and Commerce, 21(1), 1. Akkucuk, U. (2011). Combining Purchase Probabilities and Willingness to Pay Measures: A Case on Recycled Products. European Journal of Social Sciences, 23(3), 353-361. Albrecht, K. (1992). The only thing that matters: Bringing the power of the customer into the center of your business. HarperCollins. Bolton, R. N., & Drew, J. H. (1991). A longitudinal analysis of the impact of service changes on customer attitudes. The Journal of Marketing, 1-9. Burden, S. (1998). Current trends and issues in the retail sector. European Venture Capital Journal, 1, 1-5. Carson, D., Gilmore, A., Gronhaug, K., & Perry, C. (2001). Qualitative research in marketing. Clulow, V., Barry, C., & Gerstman, J. (2007). The resource-based view and value: the customer-based view of the firm. Journal of European Industrial Training, 31(1), 19-35. Gencer, Y. G. (2015). 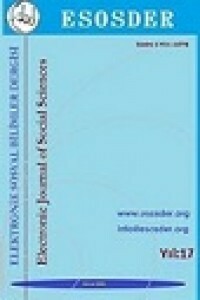 Relationship Between New Online-Socialized World And Organization Based Self Esteem. The Online Journal of Communication and Media–October, 1(4). Gencer, Y. G., & Akkucuk, U. (2017). Measuring Quality in Automobile Aftersales: AutoSERVQUAL Scale. Amfiteatru Economic, 19(44), 110. Graf, A., & Maas, P. (2008). Customer value from a customer perspective: a comprehensive review. Journal für Betriebswirtschaft, 58(1), 1-20. Grewal, D., Monroe, K. B., & Krishnan, R. (1998). The effects of price-comparison advertising on buyers' perceptions of acquisition value, transaction value, and behavioral intentions. The Journal of Marketing, 46-59. Griggs, S. (1987). Analysing qualitative data. Journal of the Market Research Society. Hartnett, M. (1998). Shopper needs must be priority. Discount Store News, 37(9), 21-22. Helkkula, A., Kelleher, C., & Pihlström, M. (2012). Characterizing value as an experience: implications for service researchers and managers. Journal of Service Research, 15(1), 59-75. Kelleher, C., & Peppard, J. (2011). Consumer Experience of Value Creation-a Phenomenological Perspective. E-European Advances in Consumer Research Volume 9. Levy, S. J., & Rook, D. W. (1999). Brands, Consumers, Symbols and Research: Sidney J Levy on Marketing. Sage Publications. Lundstrom, W. J., & Lamont, L. M. (1976). The development of a scale to measure consumer discontent. Journal of Marketing Research, 373-381. Morgan, D. L. (1997). Qualitative research methods series, Vol. 16. Focus groups as qualitative research. Oliver, R. L. (1981). Measurement and evaluation of satisfaction processes in retail settings. Journal of retailing. Porter, M. E. (1996). Competitive advantage, agglomeration economies, and regional policy. International regional science review, 19(1-2), 85-90. Shah, D., Rust, R. T., Parasuraman, A., Staelin, R., & Day, G. S. (2006). The path to customer centricity. Journal of service research, 9(2), 113-124. Treadgold, A. (1999). The outlook for Asian retailing. Discount Merchandiser, 39(5), 45-46.
Zimmer, M. R., & Golden, L. L. (1988). Impressions of retail stores: A content analysis of consume. Journal of retailing, 64(3), 265.